Dr. Lazzaro is a board-certified dermatologist, specializing in medical, surgical and cosmetic dermatology who practices in our Naples, Long Beach office. She loves all aspect of skin care and enjoys educating patients on ways to keep their skin looking young and healthy! She completed her dermatology residency training at Michigan State University, Mclaren Oakland Hospital where she served as chief resident. She attended medical school at Western University of Health Sciences and obtained her undergraduate degree from the University of California, Berkeley. Dr. Lazzaro is widely published in many peer-reviewed articles in medical journals and has received numerous awards for her research and presentations. 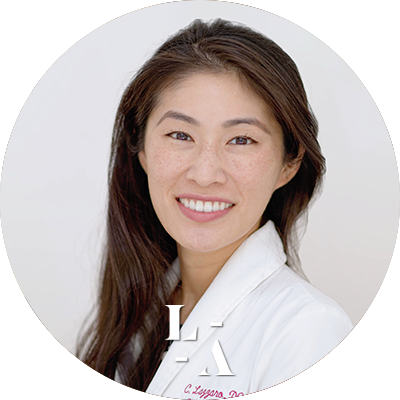 She is active as a fellow of the American Academy of Dermatology, American Osteopathic College of Dermatology, and American Osteopathic Association. She also is proudly serving as a Clinical Assistant Professor of Dermatology at Western University of Health Sciences. In her free time, Dr. Lazzaro enjoys yoga, gardening, listening to podcasts, and learning to play the ukulele.